You’re about to find out how well you understand Australian English signs. Want more English quizzes? Check out The Big, Fat Clark and Miller English Quiz 2017. Back in August, I was in England and wrote a quiz about British English signs. Signs are everywhere in England, and some of them are quite difficult to understand. Right now, I’m in Australia, on the other side of the world. They like signs here, too. Wherever you go, you can see a sign telling you to do something or telling you not to do something. If you’re thinking of visiting Australia, there’s some good news: the signs here are easier to understand than the ones in England. But, like in England, some of the signs are just very, very confusing for English learners. 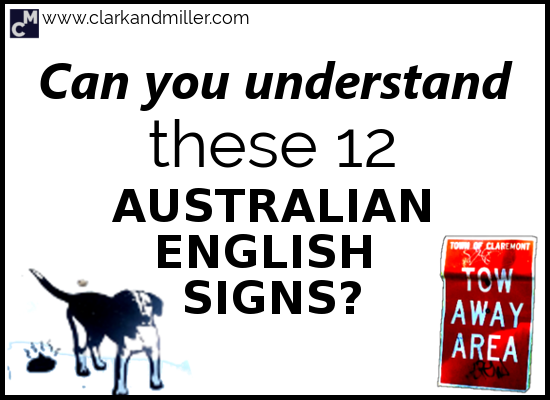 So — put yourself to the test and increase your English vocabulary with the Clark and Miller Australian Sign Quiz! The quiz might take a while to open, but it’s worth it. You’ll see! Don’t send us bills that are more than $200. You won’t pay more than $200 at this place. If you put up posters here, you’ll have to pay $200. Only the army can use this bin. You can put any type of rubbish here. It’s sad that we produce so much rubbish. Some people might be lying in the road. Be careful. We’ve changed the shape of the road. This road is very modern. Get off your bike here. Don’t get off your bike here. The hill here is difficult for cyclists. Wanna party? This is the place for a party! Party here! Don’t park here, or we’ll take your car. You can’t go behind this sign. There’s no cable TV in this area. You need to pay to go here. You’re travelling on a student / retired person’s ticket? Prove it when we ask! You have to tell us why you’re taking this trip before buying a ticket. You have to give us a little dance before you get on the train (except if you’re old or disabled). Please don’t use your phone in the car. Thank you. Please stop doing your work on the road. Thank you. There are no more people digging up the road from here. Thank you. Come here when there’s a fire. Do you need to build something like a small boat or a simple computer processor? This is the place! This is the most dangerous part of the building when there’s a storm. Don’t go here when there’s a storm. Push and speak to the driver about football. Push and speak to the driver but only in an emergency. Push and speak to the driver, but if it’s not an emergency, we’ll do something. Like charge you money probably. We haven’t decided what yet. Please don’t use this road as a shortcut. This road stops suddenly. You can’t drive through it. Looking for a road? There are no roads here. Try somewhere else. This train works best when you’re with Harry Potter. Also, we’re filming you. You need to be healthy and safe to use this train. Also, we’re filming you. I have no idea what a “security device” means. It could be anything. Also, we’re filming you. OK! So — how was it? Did you learn some new words? Let’s test you on what you’ve learned. Can you say what these words mean? Did you find this useful? Do you know any people (or antelopes) that might also benefit from this? Then BE AWESOME AND SHARE! Spread the knowledge! These are good, and thanks for posting. But you might want to try checking 2, 3, 4, 6, and 10 again. This time I’d recommend not going straight for the dictionary/translate and check the words in the context of the pictures and the quiz. This way you’ll get a much clearer meaning of how they’re being used in this situation. Learning from context is a great skill to develop and can work wonders for your English! I have never been to Australia but common sense and speaking command helped me to understand everything correctly. That’s great Olga. The best language skills to have are “common sense” and being able to figure stuff out from the context. Good work! One wrong, darn it! Read the answers too quickly / distractedly. 10 out of 12 is pretty good, Eugene. Well done! I tested this on a real live Australian person and she only got 11/12 — I think one of them is a bit of a trick question. Thank you so much for your answer. I understand what you mean. The fact is that I hadn´t done the quiz before sending the answers. It turned out to be very, very useful. I see now “penalty” refers to ” fine “, for example. I will give it a try, this quiz looks fun!